"Straight from Greece! 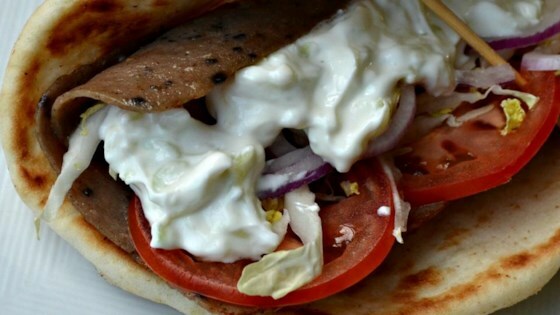 This recipe has been in my family for years - my Auntie showed me how to make it this Greek Easter - great with raw red peppers and pita chips." Peel cucumbers and grate into a colander. Squeeze out excess water. Mix together sour cream, yogurt, garlic, and olive oil in a large bowl. Stir in cucumbers. Chill at least 30 minutes and up to 2 hours before serving. Good, but this tasted too much like sour cream. I think this would have been fine using greek yogurt as the base. Great, refreshing dip. I cut the recipe in half. What is missing is fresh dill and a bit of lemon. I used reduced fat dairy. Excellent recipe! I vacationed in Crete for 3 weeks in January 2007. So, I know what authentic tzatziki sauce is suppose to taste like. This recipe is definitely right up there! I almost, well maybe I actually did, lick the bowl. That's saying a lot for someone who doesn't like cucmbers! I only made enough for 5-7 people... definitely need to make more next time!